It is simply not enough to buy an air compressor. More often than not, we would need accessories to fully maximize the use of the tool. Fortunately, there are air compressor models which come with an accessory kit already. 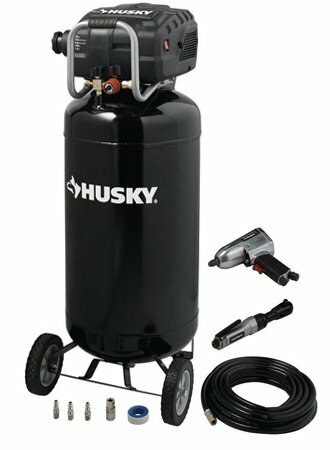 Husky 4 Gallon Air Compressor BS1004W comes with a variety of accessories which include the following: 1/4-inch NPT connects for all fittings, air blow gun for cleaning, air hose, and nozzle and needles for inflation applications. These can be used for several home projects that you need to accomplish. This model has an induction motor designed to provide extended working life. Power output is at 1 HP. Although this is not the strongest model, it can perform DIY activities and light-duty garage tasks. Air delivery is 3.7 SCFM at 40 psi and 2.7 SCFM at 90 psi. The maximum pressure is at 135 psi. These output can be used for the following applications: blow cleaning, brad nailing/stapling, hobby nailing, hobby painting, and inflation. It can easily keep up with flooring activities and can power tools such as a ridged stapler. The tank has a total capacity of 4 gallon. This storage capacity is ideal only for light-duty tasks. It is made of steel and is ASME certified so it is 100% guaranteed to be safe. It is hotdog-styled which adds to its portability. 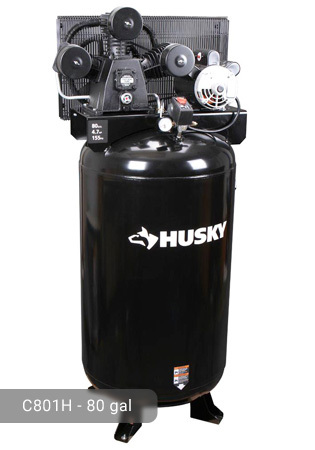 The twin stack tank configuration is another distinct feature of this Husky 4 gal air compressor. The single-stage compression ensures the delivery of air without dirt or contaminants. 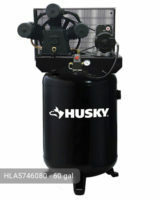 The pump of this Husky 4 gallon air compressor is oil-free so there would be less maintenance activities needed. Also, no need to worry about leaks and frequent monitoring of oil level. It has automatic start/stop feature which controls the level of pressure reliably. The universal quick connectors allow you to finish your tasks at a shorter period of time. This model is electric-powered so you would need to plug it in a 120-volt power outlet to start its operations. This unit is very portable. It has a handle that allows you to carry it around without hassle. 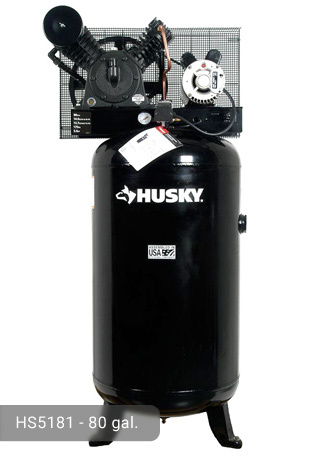 The structure of the compressor was designed so that it wouldn’t bump on you and your surroundings while it is being transported. It only weighs 39 lbs. so any adult would have no problem bringing it from one place to another. 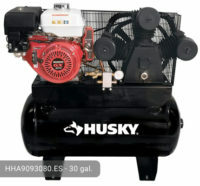 For an air compressor with a small tank capacity, this model is fairly loud but is still tolerable (up to 85 decibels). This model can be stored in small places because of its compact structure. Husky 4 Gal. 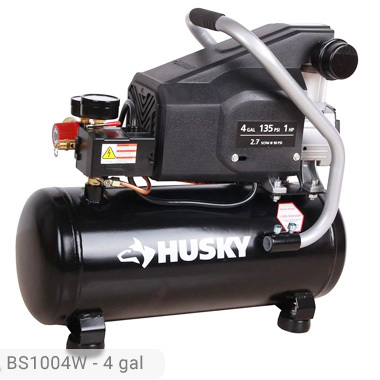 Portable Electric Powered Air Compressor is being offered at an affordable price. The entire package only costs less than $200.00. Considering that it only has a 4-gallon capacity, this machine is very efficient in its own way. The tools included in the bonus kit are also of high-quality and can provide the services that you need. Buying them individually can cost you more so consider yourself lucky with this package. If you already own Husky BS1004W model or just want to buy it, feel free to share your review or ask a question through the form below. Where can I get the Aluminum tubing(from the compressor to tank). Also, WHAT OD size is it??? 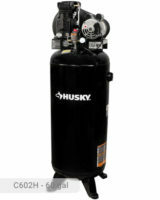 Just bought Husky 4 Gal Air Compressor, BS1004W. It has good pressure, but using the blow tool, it doesn’t move pine needles off a deck at 1 inch away. For now I’m going to get a new blow tool, and see if that is the problem. Any ideas? Just pick up one of this at Home Depot for $33 it’s on sale now, brand new. You have to connect the little air hole piece to the blow tool. It looks like an arrow. It doesn’t work too good but I cleared my whole porch off with this.